President Barack Obama’s recent announcement of an unexpectedly rapid drawdown of American troops in Afghanistan is producing a bitter reaction in Pakistan to the effect that America makes promises but, once again, is ignoring its promises and abandoning its allies, and that the Obama administration is acting for political purposes, and following narrow parochial interests. These concerns have been fed by increases in cross-border attacks between Afghanistan and Pakistan. On Wednesday, hundreds of militants crossed from Afghanistan and attacked several border villages in Pakistan, triggering shootouts with local militias that killed at least five people, according to AP. On Tuesday, at least 150 militants came from Pakistan and overran three border checkpoints in eastern Afghanistan near the border, killing at least 12 Afghan border policemen. These acts are increasing tensions between Afghanistan and Pakistan. Afganistan is accusing Pakistan of intentionally firing rockets into Afghanistan, firing at militants. The accusations have been denied. As tensions grow between Afghanistan and Pakistan, relations between the U.S. and Pakistan are in free fall. 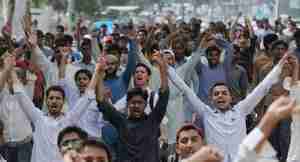 The U.S. has sharply reduced military aid to Pakistan, and the Pakistanis have thrown the Americans out of an airbase on Pakistani soil. The concern is that Pakistan could, once and for all, cut off the land route used by American forces to bring food, fuel and equipment from Karachi harbor to Afghanistan. There was, in fact, a brief cutoff in September. 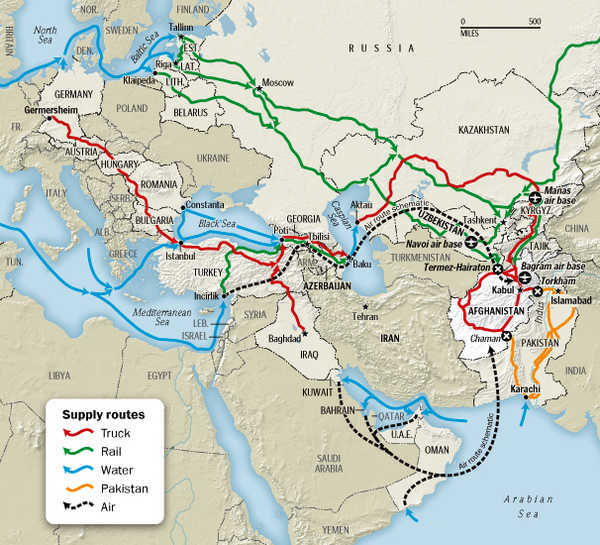 For that reason, the U.S. military is rapidly expanding its aerial and Central Asian supply routes to the war in Afghanistan, according to the Washington Post. The map at the beginning of this report shows the new routes. From the point of view of Generational Dynamics, the Afghan counterinsurgency never had a chance of succeeding, largely because of the Pakistan connection. (See “30-Jun-11 News — Terrorist bombing of Kabul hotel shows power of Haqqani network.”) And anyway, in the end, the war in Afghanistan will be less important than the coming nuclear war between Pakistan and India.